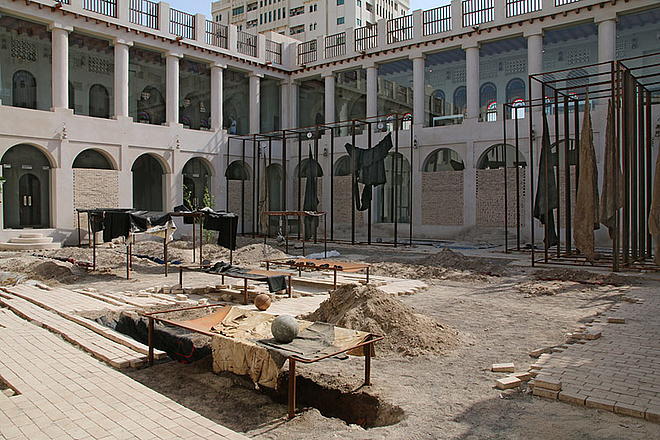 This site-specific installation, occupying the open courtyard and two corridors of Bait Al Serkal, is an absurd and silent anti-monument, in which the idea of a finished work becomes inseparable from process and material. Featuring paintings and steel structures inspired by morgue tables, the installation comprises unique canvases that have been covered with several layers of paint on both sides and displayed throughout the courtyard. Some of the paintings have been cut into strips and then sewn together so that they can be presented in a unique pattern; others bear evidence of previous use as oil pads in the studio. Alternating sheer and opaque surfaces distinguish newer canvases from older ones, and the lingering smell of paint offers a sense of the ongoing process of production —punctuating the concept of rebirth. Oscar Murillo: Yes, since December. You don't come to these conclusions overnight. Up from January, with the help of my uncle, my mother's friend and my cousin, I began to do trials, experimentations, some of the works in situ. The paintings covering the trenches where all done here. Oscar Murillo: That kind of connotations turn up, inevitably. You're burying and excavating, and the dynamic nature of the canvases lining the trenches supports this representation. Gerhard Haupt: Did you choose this space, or did the Biennial recommend it to you? Oscar Murillo: They recommended the space. I found it really hard at the beginning, because it's too much of a symbolic space. Gerhard Haupt: … having been the residency of the British Commissioner for the Arabian Gulf, and in the 1960s, the first hospital in Sharjah. Oscar Murillo: Exactly, it has all these historical connotations. And now it is one of the main spaces in the Biennial, and I didn't really want that. But this was before I spoke to Christine Tohmé about her intentions as a curator regarding how she saw me contributing to her biennial. Obviously, from her point of view, it was a huge leap of faith, because I didn't come with a concrete proposal. But she said, no worries, spend time with space and see how you feel. Pat Binder: When you came it was still all paved and the windows open just as usual, right? Because we know it from before, empty and open as a normal courtyard, or as a space to contain an artwork. Oscar Murillo: Yes, but now, the moment you enter, even while you are in the corridor before entering it, you have a feeling of oppression, because I have blocked up with bricks some of these windows. And then the space opens up in a kind of explosion, and you feel this doesn't belong here. But I think it does belong. I was talking to Khalil Rabah who is also in the Biennial, about how a lot of the workers here in the UAE pave by hand whole streets, and they do this literally overnight. It's about this energy that isn't negative nor positive, but is a strong energy nevertheless, and has a strong magnetizing undertone. But to mention the title "Condiciones aún por titular", conditions yet not known, or yet to be defined, this is because I don't want to allude directly to specific things. Gerhard Haupt: So, tell us about the canvases that you made here, and those "bed" structures. Oscar Murillo: The black canvases that you see belong to a body of work that I have been developing since 2014. I started maybe a year before the Venice Biennale. The canvases on the beds or in the trenches were done in situ. They are more like drawings and refer to "existing in a transition of space", as it is, for example, in the case of flying. I have a diary with me, an album that has images of my family from the 1970s to the early 2000, but also has a lot of sketches and drawings done while spending hours in an airplane, a means of staying active during vast amounts of travelling. Some of them are manifested here on canvas. They are simple, almost cave-like drawings. An airplane, for example, the noting of it's speed, the altitude, and so on. The "beds" are inspired by morgue tables. They have the curved form of a body. You can imagine a body prepared for an autopsy. Some have different heights, and I play with that. The "burnt" rocks that you see are made of corn and red clay. 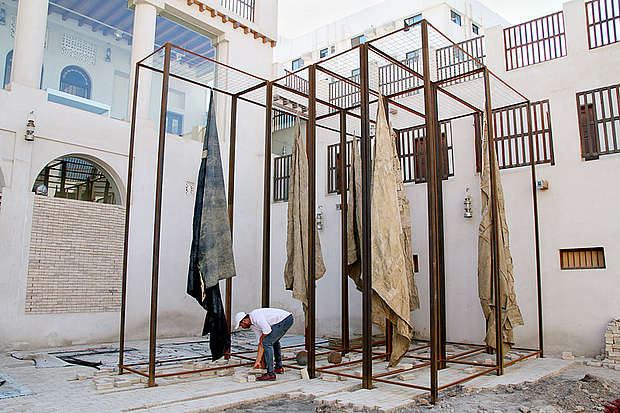 Pat Binder: The texture of those "burnt stones" reminds me of the texture of the coral stones which are a traditional construction element here in Sharjah. 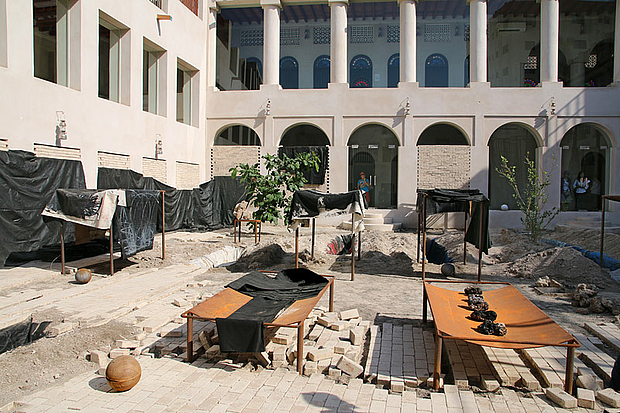 Oscar Murillo: Yes, that was a coincidence, but in fact, some of the digging in the courtyard uncovered things like buried coral stones from former constructions. Pat Binder: What also strikes me are the hanging canvases that look like skins or flesh. The textural elements of the installation are very strong, stronger somehow than the paintings, and I mean this for the pure perception the viewer. Oscar Murillo: Earlier on, as a younger artist, one had more defined or restricted means, not talking in financial terms. And as these kind of invitations like Sharjah are laid-out, you begin to have the energy and the guts for this mark-making movement of best manifesting things that are very profound, and conveying them to the audience. This is what this installation aims to achieve. Oscar Murillo: I feel that this is fundamentally one of my strongest works. It started as an idea in 2014 in Bogotá, while working with María Belén Sáez de Ibarra, the curator of the Museum of Art of the National University of Colombia. The idea of the beds, the canvases and paintings started in Bogotá, which is a place that has been an epicentre of sorrow throughout the decades. The project there meant my first steps towards becoming aware of what does these black canvases mean in this expanded idea of painting, but also in terms of how can they be utilized as a wider signifier in my practice. And then, the Venice Biennale happened, where I hung those black flag paintings on the façade of the Central Pavilion in the Giardini, and afterwards, I began to do all these shows in different parts of the world —realizing how important geography is. It's so different to do my work in the confines of my studio space in London. I came to that conclusion when Eungie Joo invited me to be part of the Anyang Public Art Project in South Korea, in the mountains, where I was truly exposed to the elements, and where we did a kind of performance with spiritual leaders, which very much translated the energy and spirituality of the place. After that project I found it really hard to get back to doing this these black sewn-together works in my studio in London. And while I was thinking about setting up a studio situation somewhere in the world that is significant, coincidentally, Sharjah came with the invitation. And now here we see a progression from all of that. Oscar Murillo: …as we all have to keep going as human beings! Publishers of Universes in Universe - Worlds of Art, based in Berlin. courtyard of Bait Al Serkal. Oscar Murillo: * 1986 La Paila, Valle del Cauca, Colombia. Lives in London, UK.